The Inn at Sunset Cliffs has been waiting for the right technology, to become a more water efficient hotel. We know water pressure is important while showering. Until now, commercial products have been a bit behind in technology. The Water Saver Shop has introduced us to the new products available for commercial use that will actually help rather than hurt. Located in Ocean Beach San Diego, The Water Saver Shop knows water.Looking to ensure our lifestyles will remain luxury, new technology such as theirs is necessary. We have already done the switch to decrease water flow and still keep the same water pressure a few years ago. We have now taken it one more step further to help our planet! Way less water flow with an incredilble stronger water pressure than before! Technology has come a long ways to allow us to save water and now it is necessary we take steps to help conserve as much as we can. The hotel is not only a Green Friendly hotel! We are also now Blue Friendly!!! Trying to save as much water as we can with new technology will benefit our guest. We currently save 408 gallons of water per day when the hotel is fully occupied compared to two years ago. When we made our switch in April of 2010 we now save an additional 306 gallons of water per day compared to last years. That’s a total savings of 714 gallons of water we will be saving per day in the future compared to just two years ago. We have only accounted the water usage savings for showers! We also made necessary changes to our sinks and toilets! 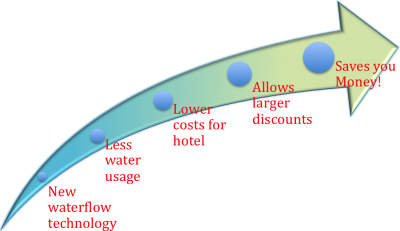 Saving even more water than before=Less water usage for hotel=lower bill costs= hotel to give discounts= saves you money!!! Help us help you! The Inn at Sunset Cliffs just installed soap dispensers! We now have shower and sink dispensers to reduce our waste in plastic. Now saving 43,000 amenity bottles per year. Easy to use, high quality soap dispensers can last a life time. We are looking forward to saving the environment even more than we did before. The amenities are the same quality as before, but we trying to put less of an affect on our environment. Our new remodel was done with 85% recycles material. GreenHouse builders has been perfecting their construction company for years and is never finished. We had the opportunity to have them remodel our hotel last year in 2011. We have new doors as well! All green products were used and even installation was efficient on the environment. Recycled all paper they used, used supplies until the product didn’t do the job anymore. Thanks you guys! GreenHouse is the greenest way to go right now. San Diego is very aware of their carbon foot print and we all invest to make the environment a better place for many centuries ahead. The hotel has always been aware of the carbon foot print it leaves. We incorporate ways to be less harmful to the environment everyday. We use cleaning supplies with the latest technology to be more efficient with productivity. Our staff members are very environmental conscious as well. Most staff choose to walk or ride their bike to work. This saves fuel emissions which are very harmful on our beach community. We do not want anything to end up in the ocean and is not supposed to be there!